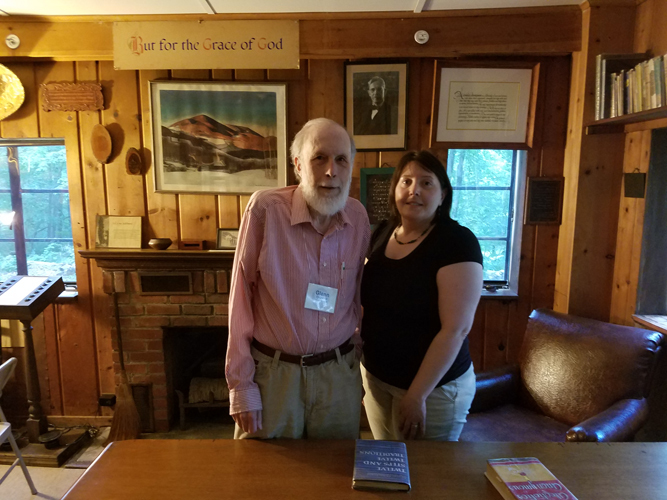 Glenn Chesnut with Sally Corbett at Wit's End, the small studio which Bill Wilson built on the grounds at Stepping Stones. This is where Bill W. did much of his writing and thinking. 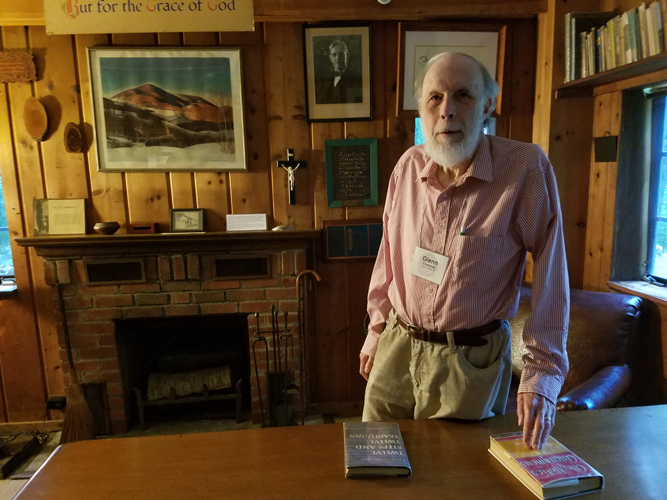 Glenn gave a talk at Stepping Stones on June 27, 2016 on Bill Wilson's relationship with Father Ed Dowling, the Jesuit Roman Catholic priest who served as his sponsor and spiritual guide from 1940 down to Father Ed's death in 1960. Glenn's book on Father Dowling had just come out a year earlier, see Father Ed Dowling: Bill Wilson's Sponsor. The book may be read online as an Adobe Acrobat file or as an MS Word file. Sally Corbett brings a wealth of professional experience to her post as Executive Director of the Stepping Stones Foundation, including seven years as Manager of Communications at the High Museum of Art, Atlanta's major art museum (and in fact the leading art museum in the Southeastern United States). 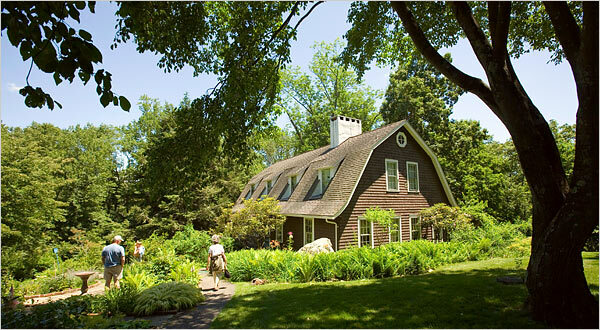 She has devoted herself to providing careful temperature and humidity controls for all the thousands of items at Stepping Stones, and using the best professional historical preservation techniques for the fabrics, woods, and furniture, as well as organizing the archival resources. Sally travels all over the United States, putting on slide shows which give visual tours of Stepping Stones for AA conferences and archival and historical meetings, including (during the last couple of years) the major annual conference of AA historians at Sedona in Arizona, as well as the major AA history conference for Northern California and the San Francisco Bay area. Sally Corbett (on the left) as White House consultant on the treatment of alcoholism and drug addiction. At the invitation of the White House Office of National Drug Control Policy, Sally Corbett, Executive Director of Stepping Stones in Katonah, participated in a national meeting Jan. 21. 2015. The first-ever ONDCP Meeting on Treating Substance Use Disorders Today: Access, Recovery, and the Affordable Care Act featured presentations and discussions about how agencies, nonprofits and others can work together to make America healthier and safer and how to help improve behavioral health outcomes, particularly in the recovery community. 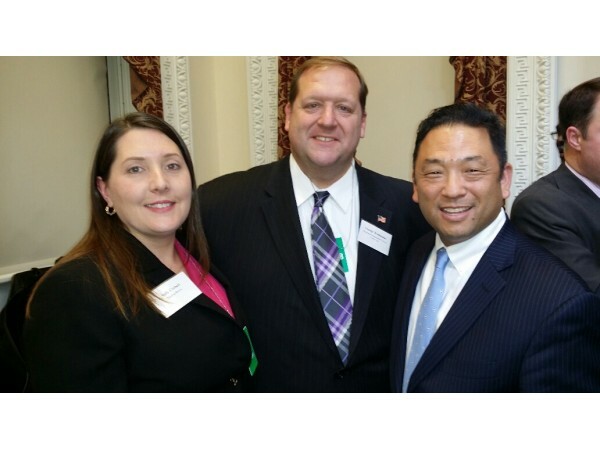 The meeting was hosted jointly by the Office of National Drug Control Policy and the Substance Abuse and Mental Health Services Administration. Glenn Chesnut at Wit's End. As a measure of the enormous admiration which Bill had for Father Ed Dowling, we can see Father Ed's cane leaning against the right side of the fireplace, and Father Ed's crucifix hanging on the wall right above the fireplace. Every time Bill Wilson walked into the little room to work at his desk, he looked at these two mementos of his beloved spiritual guide, and was motivated once again to carry out the special divine mission which Father Ed assured Bill that God had chosen him for. Father Ed Dowling's cane and crucifix in Bill Wilson's studio at Stepping Stones. The Jesuit Catholic priest was badly crippled with arthritis but hobbled about on his cane in spite of the pain, traveling all over the country. He began each day, when he was home in St. Louis, by celebrating mass at the St. Louis College Church, and then would sit afterwards in the sacristy and silently contemplate the crucifix on the wall. Only after this period of meditation would he go to the telephone and start arranging his day’s business. 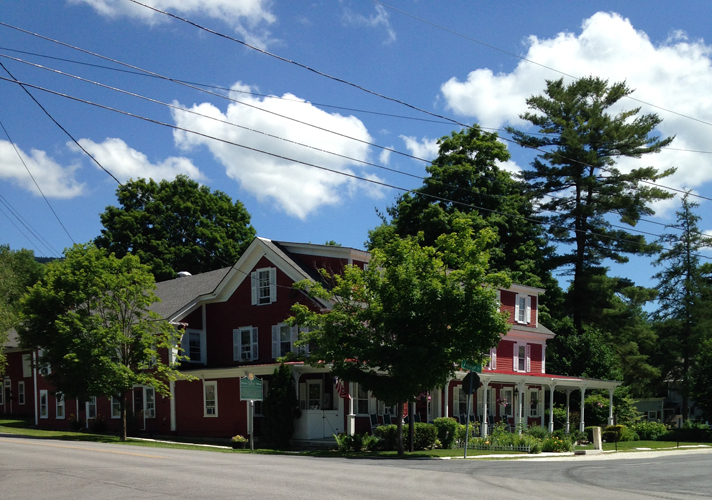 Wilson House, the hotel in East Dorset, Vermont, where Bill Wilson was born (in a small room in back of the bar) on November 26, 1895. 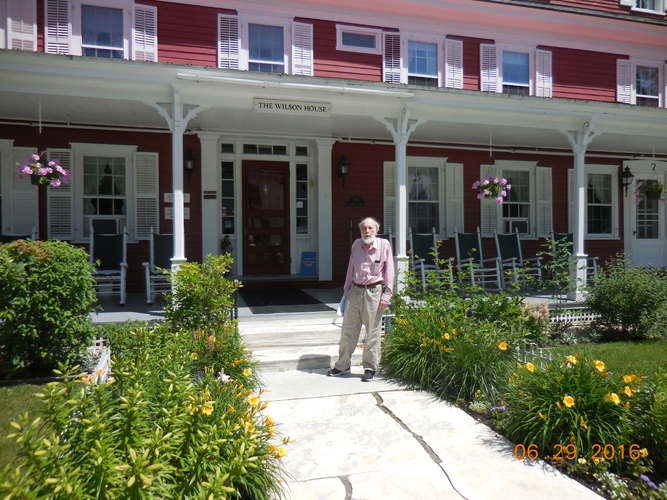 Glenn Chesnut standing on the front walk of Wilson House on June 28, 2016. Glenn Chesnut in front of the sign over to the side of the porch at Wilson House. 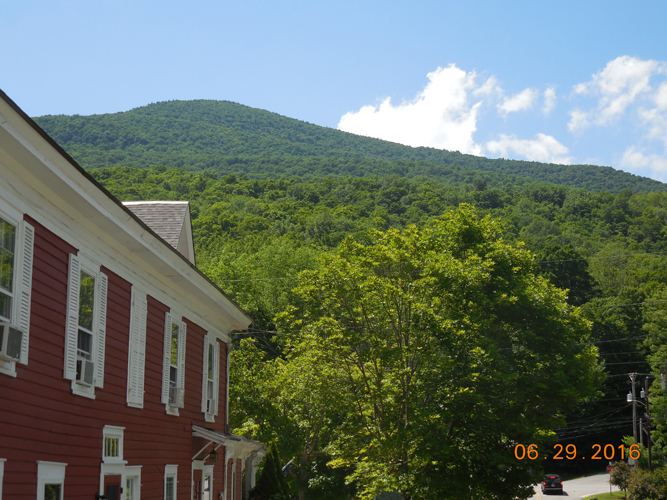 Vermont is a beautiful land of small towns dotted among enormous expanses of mountains covered with green trees, all of it under unbelievably blues skies. As you walk out the front door of Wilson House and stand on the front porch, the view to your right is the Congregational Church right across the street. This was the church Bill Wilson attended during his boyhood. As you walk out the front door of Wilson House and stand on the front porch, right in front of you stands Mount Aeolus (the photo here is actually taken from the side of Wilson House, which gives a more unobstructed view). The peak of Mount Aeolus is due west of Wilson House, a mile and a half away, and is 3,230 feet high. 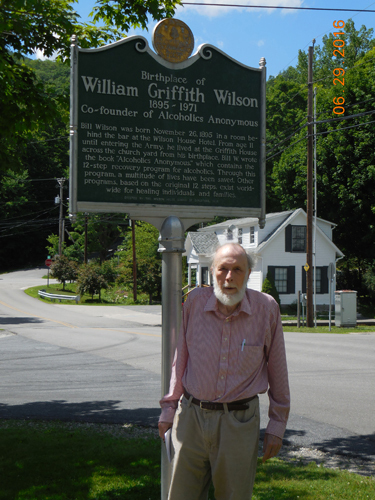 AA co-founder Bill Wilson's grandfather, William C. Wilson, was an alcoholic who finally got sober after having a vision of the Divine Light when he was standing on top of Mount Aeolus. 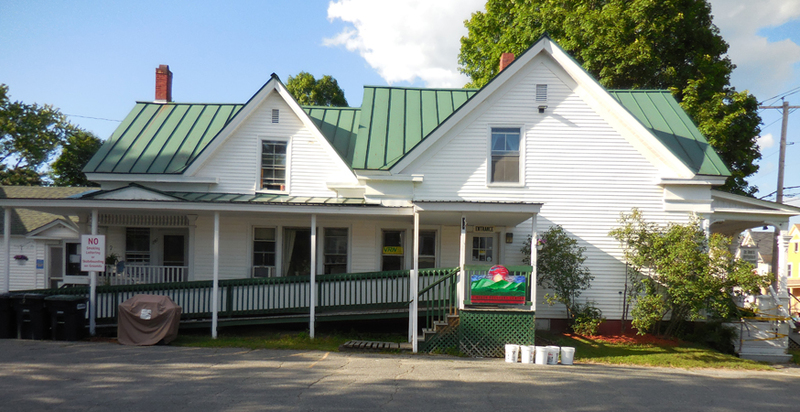 The Griffith House in East Dorset, Vermont, where Bill Wilson began living with his maternal grandparents when he turned 11. These were Gardner Fayette Griffith (1841-1924) and Ella A. Brock Griffith (1849-1921). Fayette Griffith (as he was called) ended up being the principal father figure in Bill W.'s life. 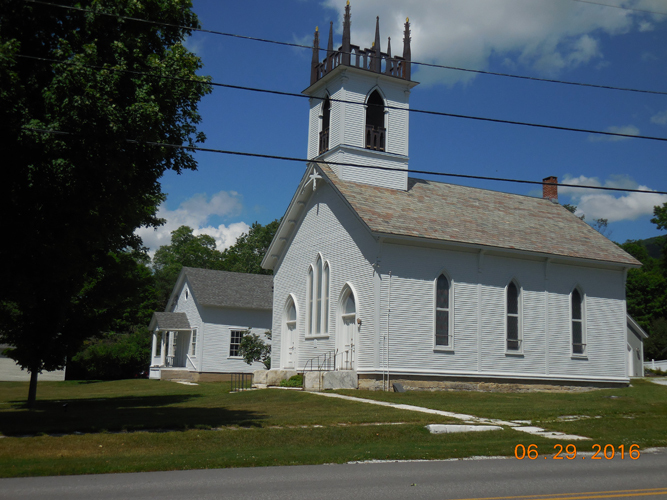 From East Dorset, we drove six miles south to Manchester, Vermont, where we looked at Burr and Burton, the private school where Bill Wilson went as a child. Every day young Bill took the train from East Dorset to Manchester, Vermont, and then walked the remaining distance to the school. In the afternoon he returned home by the same route. 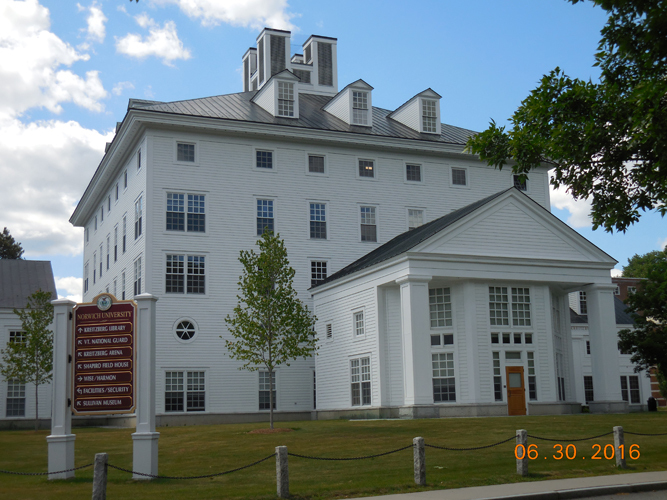 We then drove 90 miles north from the East Dorset area, and arrived at Northfield, Vermont, the site of what is now called Norwich University. 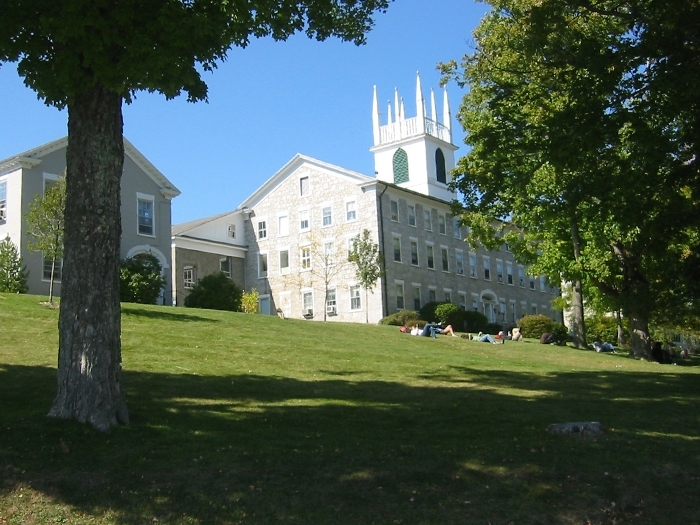 It was earlier called the Military College of the State of Vermont. Bill Wilson was attending here when the United States entered the First World War. He was commissioned as a second lieutenant and sent over to France to command a U.S. army Coast Artillery unit. 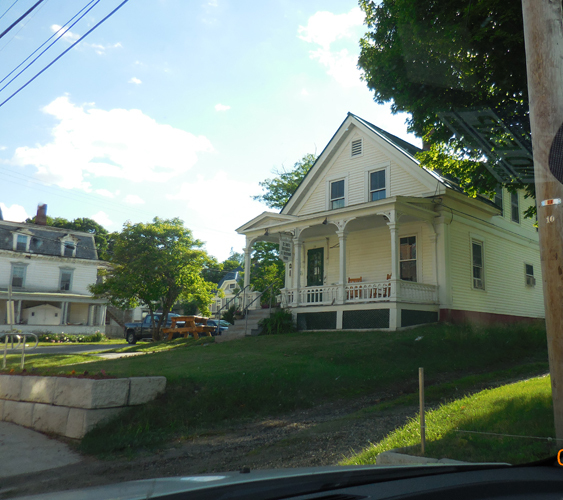 We then drove up to St. Johnsbury in far northern Vermont, close to the Canadian border. 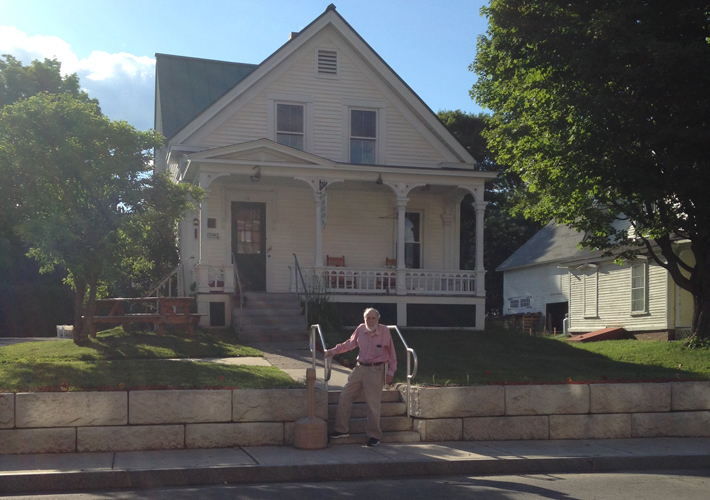 Dr. Bob, the other co-founder of AA, was born and brought up here, living in a house at 297 Summer Street. This is a photo of Glenn Chesnut standing in front of the house. Dr. Bob's childhood home from the side. 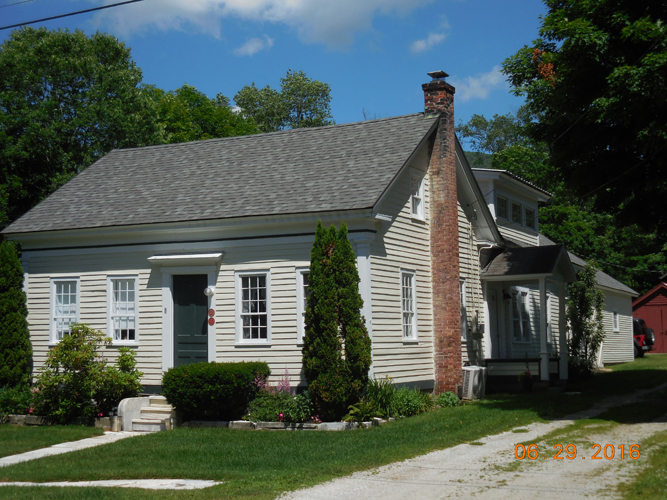 Dr. Bob's childhood home was narrow when viewed from the front, but extended well back when seen from the side street. This is the camper we got in June 2016, and used for this trip to New York State and Vermont. It was called a "Mallard," as you can see written on the side towards the back, so we nicknamed it "Ducky."